Laura Jensel has been a full-time freelance writer for over six years. Her articles and craft projects have appeared in local and national publications, including Disney's FamilyFun Magazine. She also holds a B.A. in Psychology. Circuit training involves performing a consecutive series of exercises with rest periods in-between. It's easy to customize circuit training to emphasize specific aspects of fitness you want to develop, including agility. Agility, the ability to change directions with your body quickly and efficiently, is essential for athletes and a benefit for non-athletes as well. If you've never done circuit training before, start slowly, perhaps one or two days per week. Also, be sure to plan a warm-up with stretches before your circuit training routine, and a cool-down after it, to prevent injury and enhance joint and muscle flexibility. 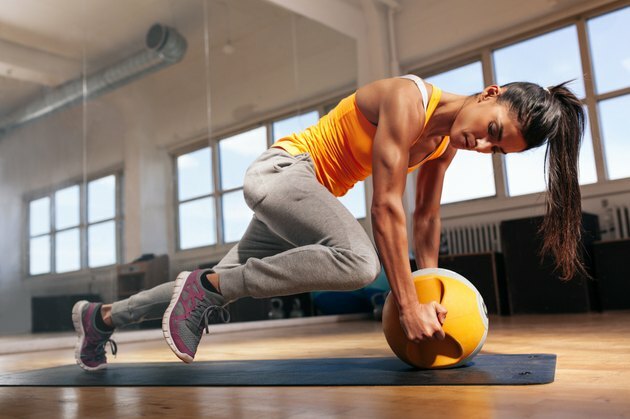 Though a typical session might involve something like five sets -- or circuits -- of 10 repetitions each, with rest intervals between repetitions, you should design your circuit training routine according to your ability level. Always consult your doctor before beginning an agility circuit training program. Ladder drills increase agility in your footwork. They are good for beginners since they won't leave you exhausted, and if you're more advanced you can add endurance or resistance training afterward. Agility ladders are commercially available, but you can mark one out with tape as well. It should be about 30-feet-long with 18-inch squares. Examples of ladder agility drills are the Hop Scotch drill and the In-Out drill. For the Hop Scotch, start at one end of the ladder and jump into the first square, landing on your left foot. Jump into the next square, landing on both feet, then into the third square, landing on your right foot. Jump into the fourth square and land on both feet again. Continue that pattern until you reach the end of the ladder. That completes one repetition. For the In-Out drill, step quickly into the first square with your left foot, then your right. Then step quickly to the outside of the second square, with your left foot and then your right. Step into the inside of the third square with your left foot first, then your right, and step to the outside of the fourth square, with your left foot and then your right. Continue the pattern, stepping inside or outside of alternating squares, until you reach the end of the ladder. That completes one repetition. Take a slow practice run of any ladder agility drill you wish to perform so that you'll be prepared to go your top speed during the actual circuit. After each repetition, walk back to the start of the ladder and repeat until you've completed all your repetitions in that circuit. Rest completely between circuits. Sprint drills improve your ability to control your speed, a necessary skill for developing agility. Good starter drills are Hollow Sprints and Cruise-and-Sprint. For Hollow Sprints, set five cones at 30 m intervals. Sprint for the first 30 m, jog for the second, and continue alternating sprints with jogging until you reach the last cone, ending on a sprint. Walk back and repeat. Cruise-and-Sprint needs a 100 m distance with a cone at the 60 m mark. Start out jogging, then gradually increase your speed until you are at your top sprinting speed at the 60 m mark. Sprint at that top speed for the final 40 m. Walk back and repeat. Since sprint drills are more taxing and take longer to do, you may want to start out with only two repetitions per circuit. When you can do your beginner circuit training program without difficulty, you can increase the challenge by either adding one day per week to your schedule or increasing your number of repetitions or circuits. Before you implement any changes, consult your doctor. Agility circuit training should be done on non-consecutive days, so schedule accordingly if you have more than one circuit training day per week. If at any time during your circuit training you feel pain or discomfort, stop or take a break, and speak with your doctor.